As most of you already know, a while ago I have started doing my own weekly link-up party (and also started joining other people's link-ups). 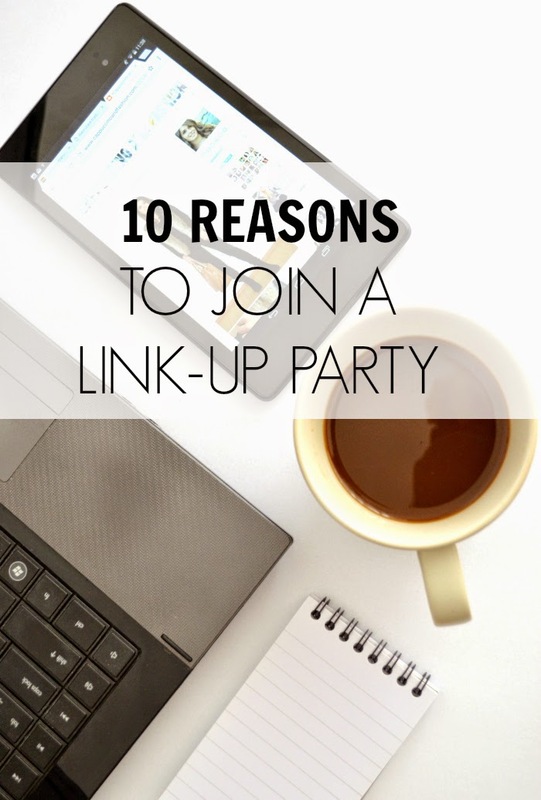 After more than 6 months of doing this, I decided I would share with you my insights on joining these link-up parties and in what way your blog would benefit from them. If you don't know what a link-up party is, it's mainly a blogpost at the bottom of which the host inserts a feature to allow every reader to post their own links to a similar post, also containing a thumbnail of their choice. 1. Be part of a community with the same interests as yours. Needless to say why this would be helpful for your blog. 2. Make your name known. Most people won't find your name or your blog, unless you try to put yourself out there. If you include your blog name in the title of your link-up entry, people will eventually start to recognize you and check out your blog. 3. Gain more exposure to your blog. This is related to the second point. Leaving your blog on different link-ups will make people more aware of your online presence and increase your blog growth. 4. Traffic increase. I have most of my traffic on days when I host/join a link-up and I'm sure you will have the same experience if you start regularly joining one. People who join these link-ups are very friendly and will most likely come to check out your blog. 5. Google Page Rank. In case you didn't already know, your Google page rank is something that helps your blog place higher in Google searches. Your rank will improve depending on a set of different things, one of them being the number of backlinks you have. Backlinks are the links that people put on their websites directing to your blog. Link-ups are also considered backlinks, so you can understand how they would help you. 6. Get inspiration for future posts of your own. This is something that I always find with linking up! I get so inspired by other people's blogposts, that I end up having ten more post ideas after browsing through them (however, try not to copy other people's ideas, that's never a nice thing to do). 7. Get motivated to post more often. I struggle so much with posting often on my blog, but I like to believe that I'm slowly getting better at it. However, I have found that since I started joining link-ups every week, they give me that push I need to get more organised and post more often on my blog. 8. Helps you keep a regular schedule. This point is also related to the previous one, but knowing that you're going to post every week on a certain day (Wednesdays for me), makes you plan ahead and actually stick to it. 9. Make like-minded friends. This is one of the loveliest things about joining a link-up regularly, you will start to see the same faces and even build online friendships with some of them. 10. Get more comments. Finally, I can definitely state that you will get much more interaction on your blog after joining some link-ups. People will definitely come check out your blog and they are the kind of users that are less likely to just click off your page, and more likely to actually live a comment or follow your blog. These are basically the things that I have experienced myself since I started joining link-ups. I hope some of you found this helpful, in case you weren't quite sure of how being part of a link-up would actually help you with your blog. I plan on doing more of these blogging tips posts, so if you have any requests or anything in particular you would like to see, let me know in the comments below. That´s sounds amazing, but one question: do yoou have to pay it or its free? Such great points! Joining link-ups has been a great way for me to connect with other bloggers and it definitely helps keep me accountable to my posting schedule.